A new month — and a new challenge — dawns tomorrow (1 June). I really enjoyed participating in the 20 Books of Summer last year so I’ve decided to do it again this year. The “challenge” is run by Cathy, who blogs at 746 Books. The idea is to read 20 books from your TBR between 1 June and 3 September. Last year I only managed to read 15, but this year I want to see if I can read the full 20. Trying to choose what to read in advance doesn’t normally work for me, because I tend to read on a whim, selecting books to meet my specific mood or interests at the time of reading. That said, I’ve pulled 20 books from my shelves but reserve the right to swap out books that aren’t working for me with other books from my existing TBR pile. All the books I’ve chosen are ones I’ve purchased or have received as a gift — there’s nothing in this lot that have come from publishers for review. They’re largely all literary fiction, with the odd crime novel and a few translations thrown in for good measure, and I’ve tried to go for a mix of male and female writers. 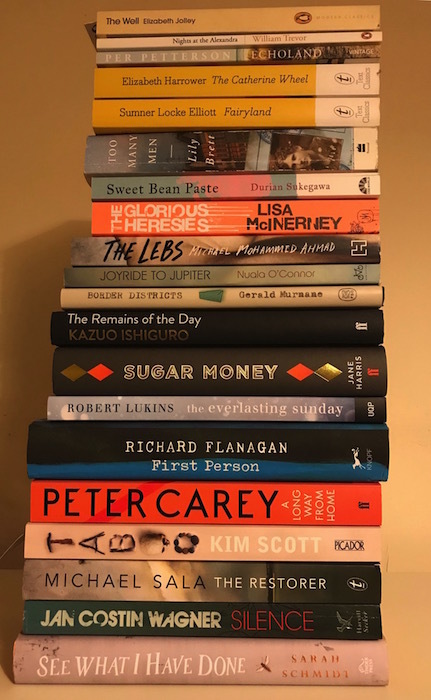 Some of you will notice there’s quite a few from the Miles Franklin Literary Award longlist, because I’m keen to kill two birds with one stone! Ive also got an Elizabeth Jolley in there, because I’m going to participate in ANZLitLovers’ Elizabeth Jolley Week (4 June to 11 June). 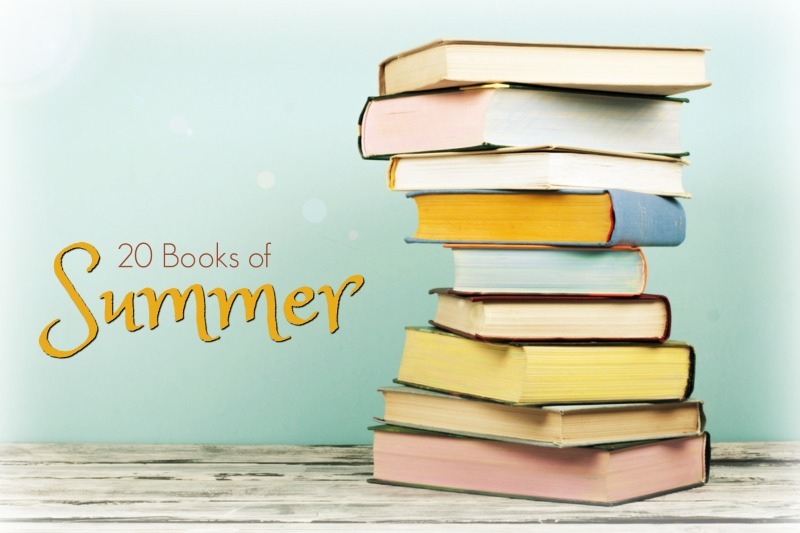 You can find out more about 20 Books of Summer at Cathy’s blog and see who else is participating on this linky page. Have you read any of the books I’ve chosen? Any suggestions on which one to start with first? Anyone else participating in this challenge? Of these I’ve only read See What I Have Done, but it was excellent – highly recommended. Very gripping and engaging, weirdly true to life. I powered through it in a couple of days! I heard a lot of good things about it when it first came out so I bought the hardcover and it’s languished on my shelves ever since! I think you’ll enjoy it – definitely worth a read! The Glorious Heresies is a riot! Thanks for joining in Kim. An interesting list! Some I’ve read and Border Districts will be my next review. Look forward especially to your reviews of Sumner Locke Elliott, Elizabeth Harrower, and Lily Brett. I’m looking forward to reading the Murnane especially… and ditto for the 3 others you mention! I recently read Remains of the Day – such a fabulous book – save that one for when you are sitting in the warm sunshine on a comfy chair and want something gentle but engaging to read. I’ve also read See What I Have Done and First Person but wasn’t overly impressed by either of them. Good to know about Remains of the Day. This is a special edition I bought earlier in the year. I do have a battered old paperback lying around somewhere too. Have noted your comments about the Schmidt and Flanagan… I admit to being in two minds about both. Heard loads of good things about Schmidt when it first came out (hence I bought the hardback) but more recently I’ve heard some less than favourable accounts, so be interesting to see what I think. Have put off reading the Flanagan for an age… I ordered it direct from Oz upon publication…but for some reason I can’t bring myself to read it. Perhaps I fear I’ll be disappointed… ? Great list! I love The Remains of the Day, and want to read Sugar Money soon too. I actually read See What I Have Done as part of my 20 Books of Summer last year. Happy summer reading! Of course, I’m going to suggest starting with The Well. But I would anyway, even if not for Elizabeth Jolley Week, because I suspect that it will appeal to you in ways that I cannot signal without spoiling it for you! Re the Murnane who is widely touted as a Nobel winner (which probably means that perversely they won’t give it to him now): in a classic example of Aussie larrikinism, Murnane and his pals have released a record. (Yes, an LP, not anything digital). As the blurb says “If Bob Dylan can win the Nobel Prize for Literature then Gerald Murnane can release a record”. See this link to see the dry humour of the cover: https://www.readings.com.au/products/25620066/words-in-order. I love it, and of course I have ordered a copy though I have no record player to play it on! I am reading The Well first. I read it as a teenager but can’t remember a thing about it! Looking forward to the Murnane, but haven’t they cancelled the Nobel this year because of some sexist/misogynistic scandal? That’s great because we need a good recent review of The Well! Yes, the Nobel cancellation has been confirmed. As I’ve said before, how come if some man behaves badly, the person who would have won the Nobel gets the punishment? What a truly splendid list of Aussie books! The Catherine Wheel disturbed me and upset me, but Harrower has that tendency. Loved Too Many Men when I read it 15-odd yrs ago too. Taboo & Border Districts are on my TBR pile (but not my #20books). I’ve just started Sugar Money – loving it, although some distressing scenes as you would expect in a book about slavery. Thanks, Brona. Can you tell I went on a bit of a shopping spree on my trip back home in March? I bought the Harrower a couple of years ago (I bought the Text set of her works) and have been reading one a year to eke them out cos I really love her stuff. A very interesting list. Kim. I’ve only read Ishiguro’s Remains of the Day, which I loved. Sharkell’s advice is spot on – it’s a great book for a lazy afternoon in the sun. I’m particularly keen to hear what you think of Nights at the Alexandra, a book I’ve looked at a couple of times when I’ve been browsing in bookshops. I haven’t read very much by Trevor, but everything I’ve tried so far has been excellent. Several unknown to me here. I’ll look forward to finding out about them. I loved the Carey which, although it’s very different, reminded me a little of Oscar and Lucinda, my favourite by him. Loved the Harris too. She does narrators so well! That’s a good recommendation re: Carey, who I have a bit of a love/hate relationship with. Oscar and Lucinda is my favourite book by him. And yes, Harris is a genius at narrators, so am looking forward to Sugar Money. Absolutely love The Glorious Heresies. See What I Have Done and The Remains of the Day are both pretty astonishing books, in very different ways. And Sugar Money is interesting, though I have some lingering uncertainties about Harris’s choice of narrator and subject (though what she does, she does well). I’ve yet to hear anyone say a bad word about The Glorious Heresies, so hoping it lives up to its fine reputation! The sequel is less brilliant, though still enjoyable—but The Glorious Heresies remains bright in my memory. I do hope you enjoy it. Another nod for The Glorious Heresies… everyone who’s read it says it’s great. Ditto for Remains of the Day. Good to hear you liked The Glorious Heresies, Sweet Bean Paste and The Remains of the Day… and sorry in advance if I add to your TBR as this challenge progresses. LOL. The Remains of the Day is obviously incredible, as is The Glorious Heresies. I’m afraid I found Sugar Money quite disappointing after Harris’s first two wonderful novels. That’s two more positive votes for The Remains of the Day and The Glorious Heresies — everyone seems to love these books. Disappointing to hear that you didn’t think Sugar Money lives up to Harris’s first two novels because I absolutely LOVED and ADORED those books and that’s the only reason I splashed out and bought this one in hard cover. Hopefully you’ll like it more than I did! Nice pile! I enjoyed The Remains of the Day and don’t know the other ones. Exciting – have fun! Thanks, Liz…I’m looking forward to working my way through this pile! I was a little worried about having a predetermined list for this challenge, as I’m quite a mood reader too, however when pulling books I tried to make sure I had a good variety. Good luck with the challenge – happy summer reading! Well, I don’t make any promises about sticking to this list. I’m sure quite a few will be swapped out as the summer unfolds. Someone commented on my list applauding me for including ‘The Remains of the Day’ when I didn’t. Seems they meant to direct that comment to you, Kim. Is Flanagan’s ‘First Person’ the last of his you have to read? I’m still making my way backwards through his works with ‘Death of a River Guide’ and ‘The Sound of One Hand Clapping’ the last of his pre-2017 works for me to read. Nuala O’Connor is only other name I immediately recognize off your stack, although I haven’t read her works. Good luck with your list! Hope it makes for a summer of enjoyable reads.